FSU senior Hannah King competed against five other teams of student-entrepreneurs from around Florida and won the statewide competition. Now, she heads to the National Finals in Denver. FSU student Adam Serota, on King's right, took second place. 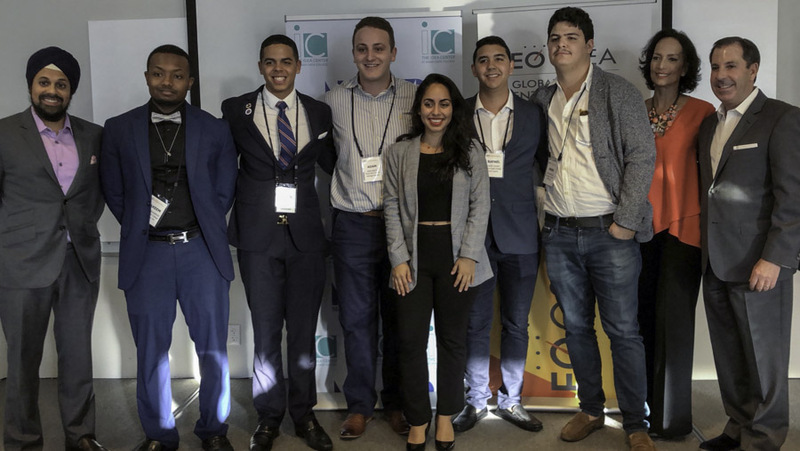 A Florida State University student has emerged as the winner of a statewide competition for student-entrepreneurs and will represent Florida at the national finals of the Global Student Entrepreneur Awards (GSEA) next year. Senior Hannah King — owner of Woven Futures, a business that markets the unique craftsmanship of Guatemalan textile weavers — earned a cash prize of $2,500 and about $20,000 worth of business services after winning the GSEA competition in Miami, Nov. 14. FSU senior Adam Serota, owner of Heritage Apparel, which offers custom design and printing options mainly for shirts, won second place. Now, King will join about 30 student-entrepreneurs from around the country to compete at the national finals in Denver in January. The winner of that competition will represent the United States at GSEA’s Global Finals next April in Macao, China. King’s business model focuses on having a socially responsible impact, emphasizing sustainable economic opportunities and production methods, as well as ethical business standards. In this photo, King stands with Juana and Carmen of the Mayan Voices Women’s Cooperative, a partner of Woven Futures. King, who has dual citizenship in America and Guatemala, was inspired to create Woven Futures after meeting artisans in Guatemala and discovering their colorful, high-quality handcrafted products. 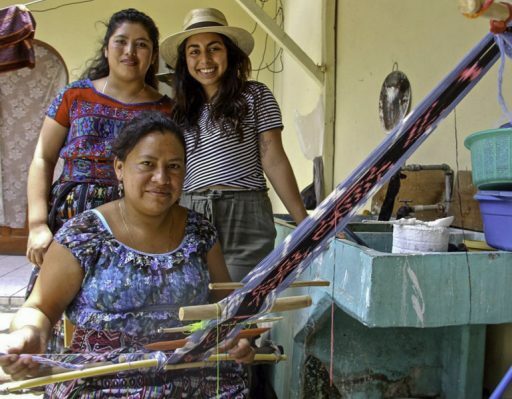 Her business has found success with a “mindful” mix of traditional Latin American weaving techniques and modern fashion sensibilities that ultimately offer economic stability to families struggling with abject poverty there. King hopes her business, which sells naturally dyed, bohemian handbags and accessories for women, offers inspiration to those who want to make a social impact with their purchases. The Global Student Entrepreneur Awards, founded by Saint Louis University, is celebrating its 20th anniversary. Its mission is to provide mentorship, recognition and connections to help students take their businesses to the next level. In December 2015, Florida State University announced the creation of the nation’s largest interdisciplinary, degree-granting school of entrepreneurship, the Jim Moran School of Entrepreneurship, as part of a major gift from Jan Moran and The Jim Moran Foundation. Students participate in traditional case study learning along with innovative hands-on application and experiences. Students accepted in the inaugural 2017-2018 class graduate with a Bachelor of Science or Bachelor of Arts in entrepreneurship.